Drop the spaghetti into a saucepan of boiling salted water. 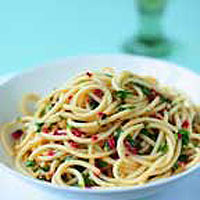 Cook until it is al dente - about 10 minutes - but check after 8 minutes as different brands of spaghetti vary. Meanwhile, put the olive oil in a small pan. Add the garlic and chilli (add the chilli seeds if you want the dish to be really hot) and place over a low heat so the garlic and chilli infuse rather than cook in the warm oil. As soon as the spaghetti is al dente, drain in a colander and return it to its saucepan. Immediately increase the heat under the frying pan and cook briskly for a couple of minutes, taking care not to burn the garlic or chilli, or they will taste bitter. Add the parsley and mix into the spaghetti with the Parmesan. Adjust the seasoning and serve with the lemon quarters. Lemon juice adds a delicious intensity to the dish.